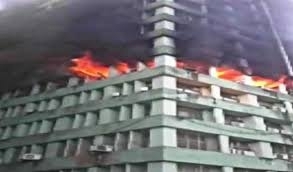 A major fire broke out on the fifth floor of Pandit Deendayal Antyodaya Bhawan at CGO Complex in New Delhi, causing the death of a CISF sub-inspector and sparking fears that several important files and documents may have been destroyed. The cause of the fire is not yet known. The building, earlier known as Paryawaran Bhawan, houses many important central government offices including offices of the drinking water and sanitation ministry, forest ministry and a branch of the Indian Air Force. The 11-storeyed building also houses several ministries including the Ministry of Social Justice Empowerment and Disability and the Ministry of Environment, Forest and Climate Change.